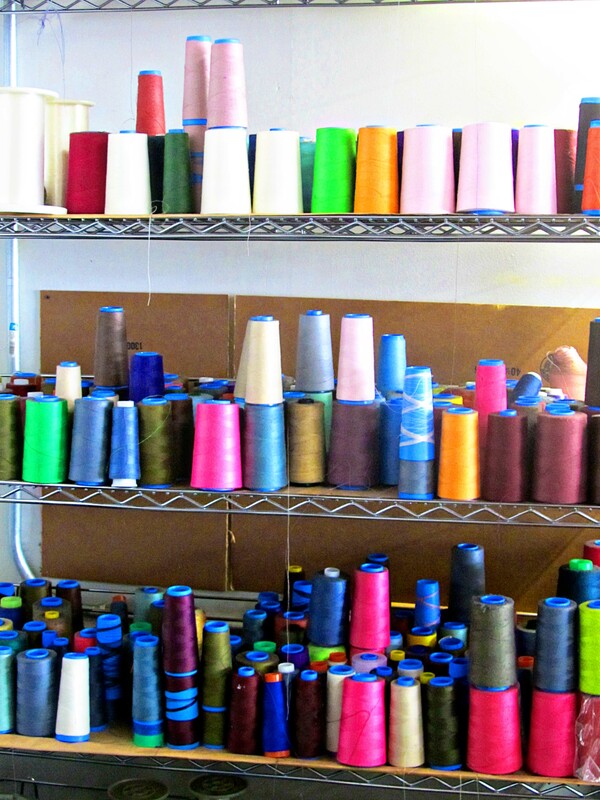 started with a short stop by the studio, and then over to the Sewing Factory. I am fascinated by how things are made, and particularly so when it is something we designed! Okay, so I am in “children’s fashion”–say that in a nasal voice–and I was expecting to always feel like the “newcomer” the “INEXPERIENCED start-up”, the UN-knowedgeable one.” Instead, at every turn, I found the most warm and welcoming people. Esther personified this warmth. We talked business, but we also laughed together. So let’s tour her sewing factory located in Southern California. 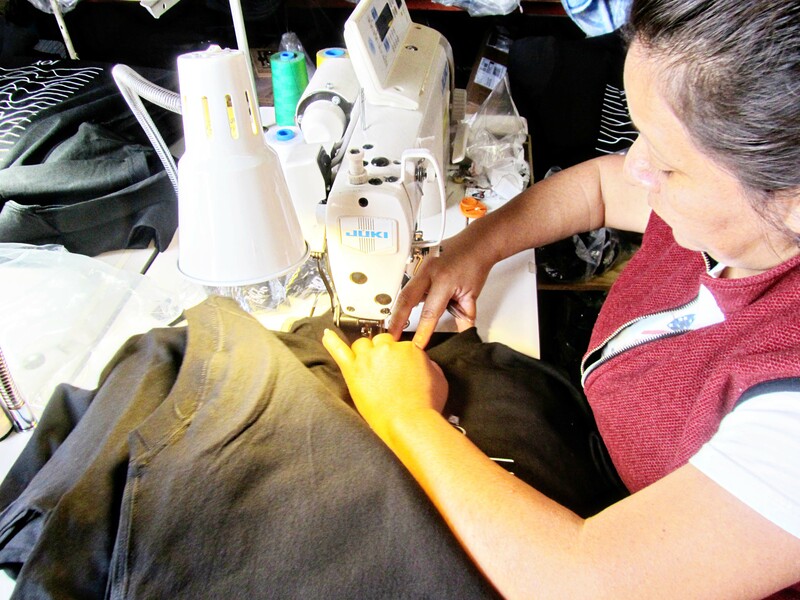 To start off, a design is sent to the sewing factory. In our case, it was a skirt and a T-shirt. Madeline had designed both, and made them in a size 4 T. From this design, the Sewing Factory makes a pattern. These are not your typical Simplicity or Butterick patterns. These patterns have to survive hundreds of cuts, so they are made on a very heavy card stock paper, not the tissue paper of home patterns. 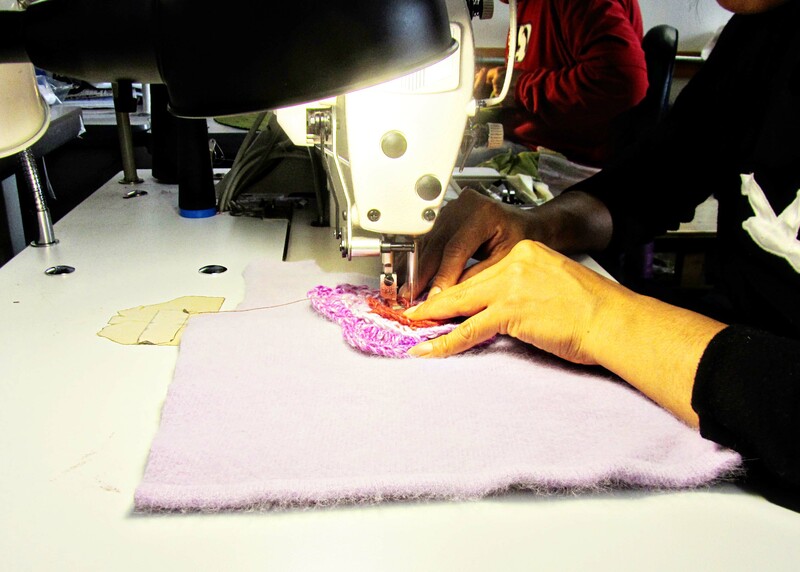 Once one pattern is made, the Sewing Factory makes up a prototype. 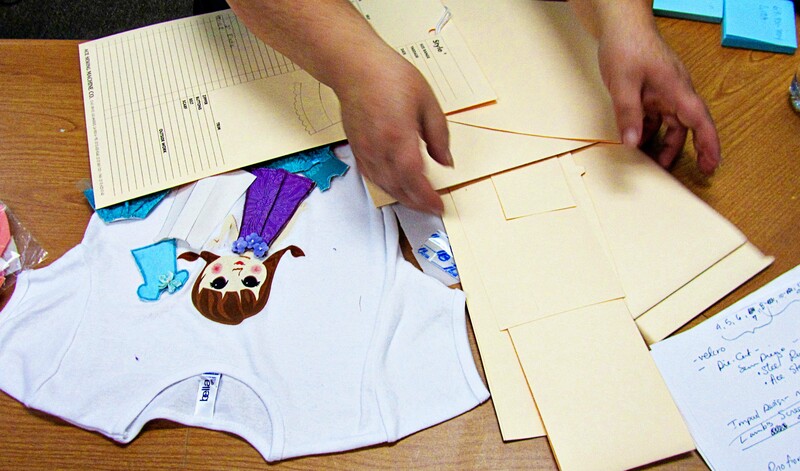 In our case, they made one size 4T skirt and a 4T, T-shirt. 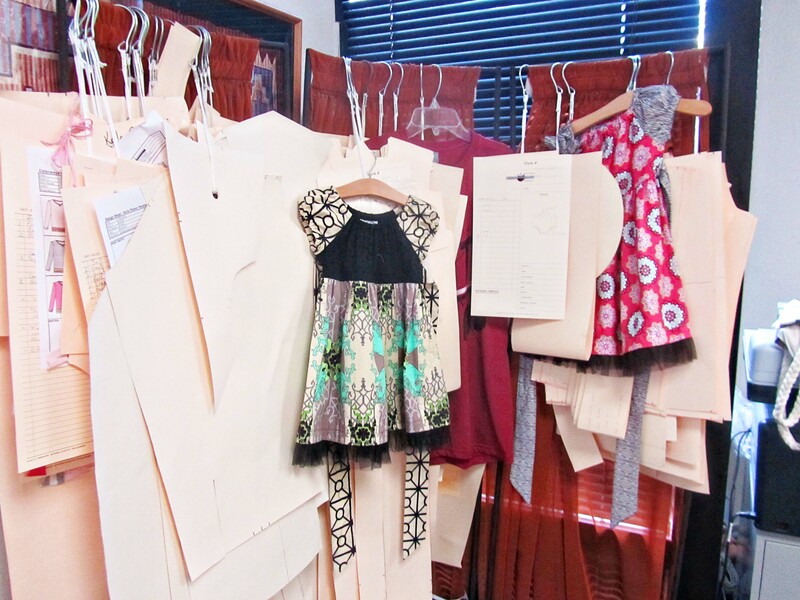 These prototypes then go back to the designer for her to approve them or make changes. The T-shirt was exactly what we wanted, but the skirt needed to be “fuller”, more “flippy.” Madeline has an eye for design and detail, so she made all the changes and approved the final design. This means that a new pattern has to be made (sometimes just some pieces need to be changed.) Because Madeline was confident in Esther’s ability to change the pattern, she didn’t ask for a second prototype, but had her make up about 6 skirts. We needed these for the models to wear for the photo shoot, and also for exhibit at the trade show. So now we have a pattern made up in a 4T, and about 6 finished skirts. But what about a 5T, 6T, size 8, size 10, etc. . .? A new pattern needs to be made for each size I wish to produce. Since we are making the skirt and T-shirt in nine different sizes, a pattern needs to be made for each and every size. This is called “grading” the pattern, and Esther’s company does that also. 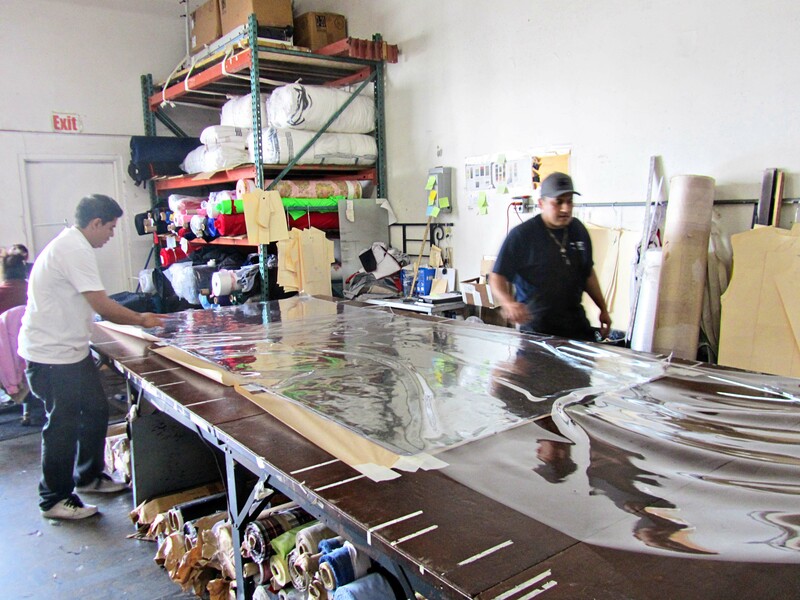 The pattern pieces are placed on this large cutting table. They have different ways of cutting–some by hand and some with a machine. Today they were cutting out large pieces of clear plastic for palette covers. I didn’t get to see them cut the pieces as they were still laying out the plastic. After each piece of plastic was rolled out, it would be pulled in all directions so that it was taunt. After the pieces are cut out, then they are sewn together. Now Esther can sew anything. She showed us a catalog for a golfer where SHE HAD MADE THE GOLF BAGS!!!! Even if you don’t know very much about sewing, you can still appreciate what a feat creating a golf bag is. She also can do small work like golfing gloves!! I was amazed at her skill and humbleness, and friendliness, and willingness to work with someone so new to the industry, like me. Thank you Esther!!! 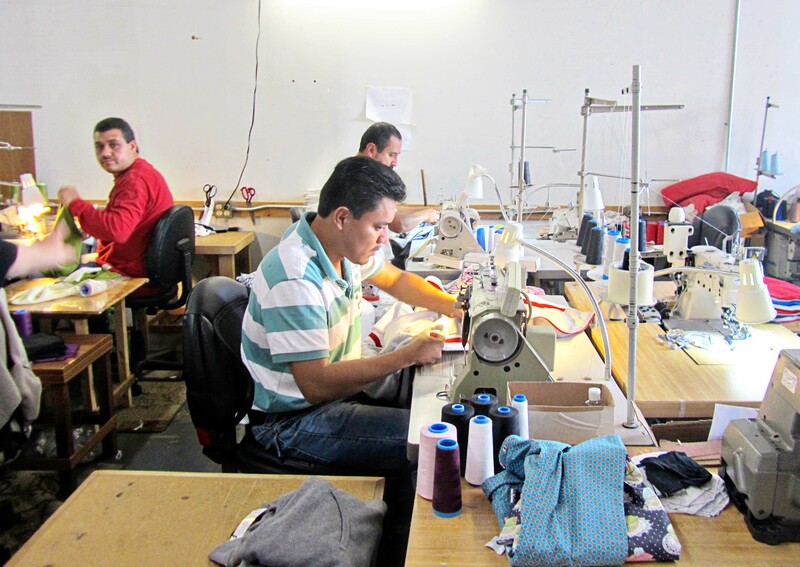 Esther’s Sewing Factory is a light filled warehouse. Since it was a perfect California day (70 and sunshiny) the large garage door at the back of the warehouse was opened up. Light and sunshine and fresh air streamed in. There was the quite buzzes of sewing machines at work, but you could still hear some birds out in the parking lot arguing about a morsel. Esther started working from her home–on her floor. Business picked up, and she moved into her garage. 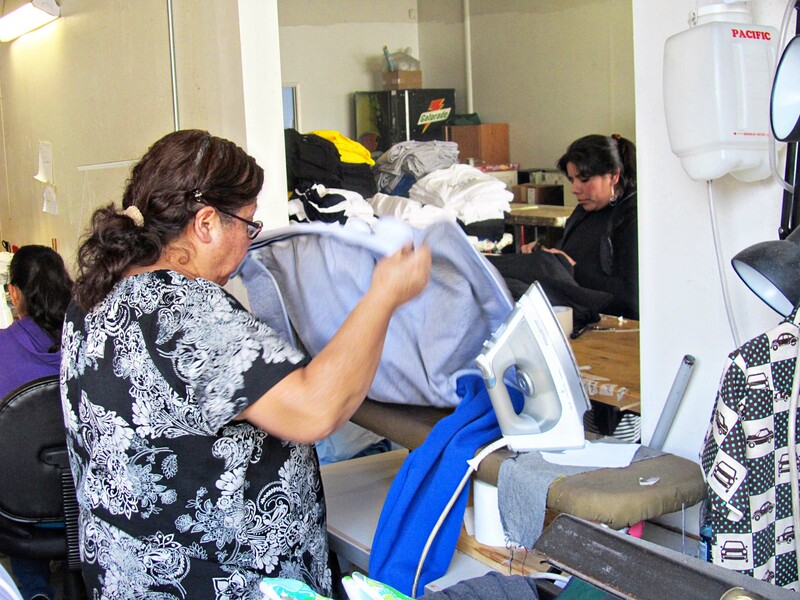 Business continued to grow, and she was told she had to move into a building. Her business hasn’t slowed down any. In fact. . . Esther was getting ready to move into an even bigger building–she needed more space. About two weeks after my visit, they moved into a new facility. Esther is a first generation immigrant who has worked INCREDIBLY hard. To me she is the spirit of what it means to be American. Her business continues to be a family run business, and I had the privilege of meeting her daughter and son. But we aren’t finished. When you buy a shirt in a store there are several little “extras” on the shirt–such as labels. If we wanted to commercially produce these shirts, we needed labels. Size Labels–S, M, L, or 10, 12, etc. . . In some cases, these labels are combined. For example the size is printed on the Brand Label or other combinations. Each “extra” you add to a product increases the price, so we tried to keep it as cost-effective as possible. Because our Brand Label came from one vendor, and our Size Label and Care Label came from a different vendor, we had to order all three labels. Care Labels are kind of like mini-legal documents. There are regulations on what you are allowed to include, what you have to include, and how it has to be presented. Thankfully, the U.S. government has a helpful website. Brand Labels need artwork. So it was back to Brenda of Secret-Agent Josephine for some artwork. The artwork gets sent, to the label company which “weaves” one label. 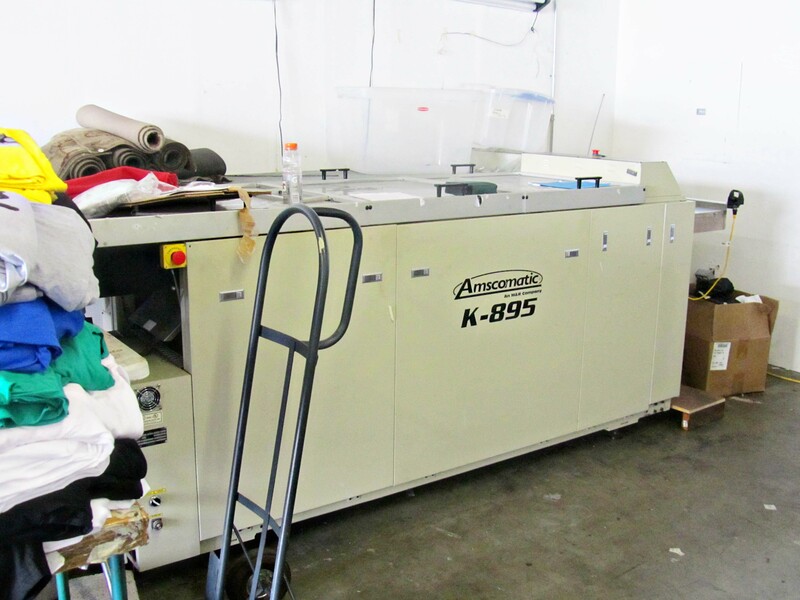 (Here is a link to a photograph of a woven label making machine.) We had to make some adjustments as it appeared too crowded. Since I had talked with the company several times, I trusted them to make the final product without a second revision. The label turned out just how we wanted it, and here is a sample. These labels are heat cut, so that they don’t have rough edges that need to be turned under when attached. These label were sent to California from Texas. So back to the Sewing Factory to sew in all three labels. And this is how they sew in a tag, “trrrrriiit” and a label is sewn in. The presser foot is not operated by hand, but by foot, so both hands are always free. “Trrrrrriiit,” “trrrriiittt,” “trrriiiiittt,” and three labels were sewn in. Esther runs a very smooth operation. There are many different machines, and each performs a different task. 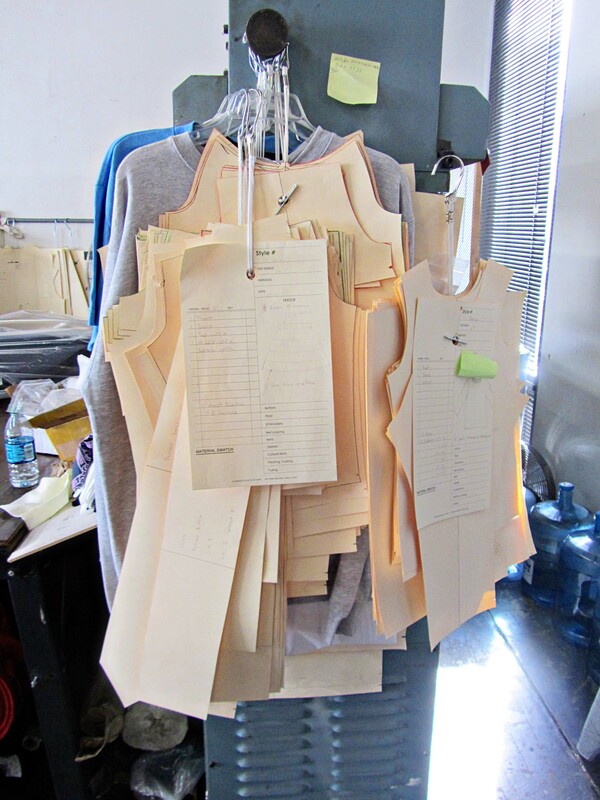 In the photo above labels are being sewn into the neck of a T-shirt. This machine is sewing on a knitted flower. 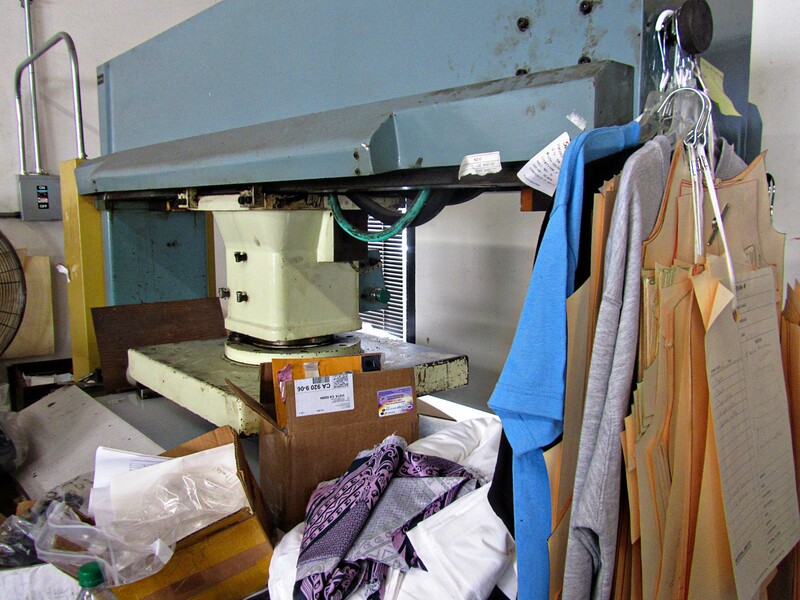 This machine is used to punch out fabric cut with dies. We are working on getting some dies made for Ypsi Doll as we have several small pieces that are difficult to cut out by hand. 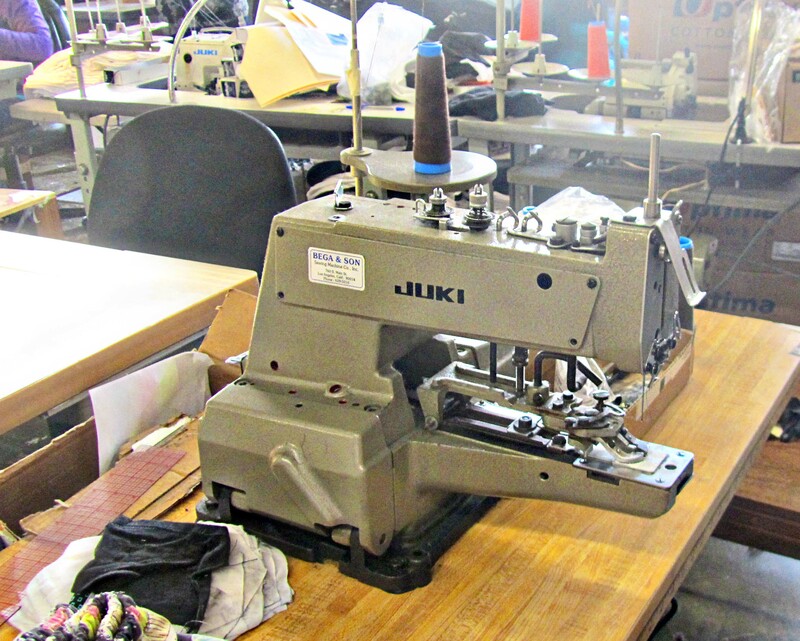 This machine is used to sew on buttons. This machine irons the finished product. This lady is Quality Control. No garment is sent to the folding room without her inspection and approval. 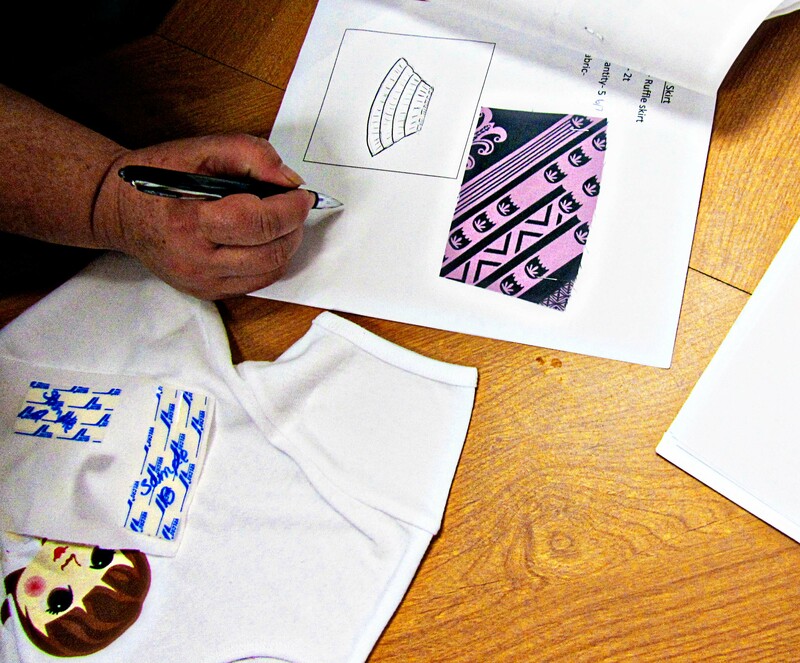 I greatly enjoyed my tour, and Esther was very kind to let me photograph the process of an idea becoming a shirt. One final consultation in her office, and we finished our tour/business meeting. The “Idea to Finished Product Tour” will continue. This entry was posted in She said... and tagged industrial patterns, labels, pilot's wife, sewing factory, T-shirt design. Bookmark the permalink. Don’t think of all the steps when trying on a new garment……labels and all!! Kind of crazy, when the first thing my daughter does is cut out all the “itchy labels” off her new clothes. Very, very cool. 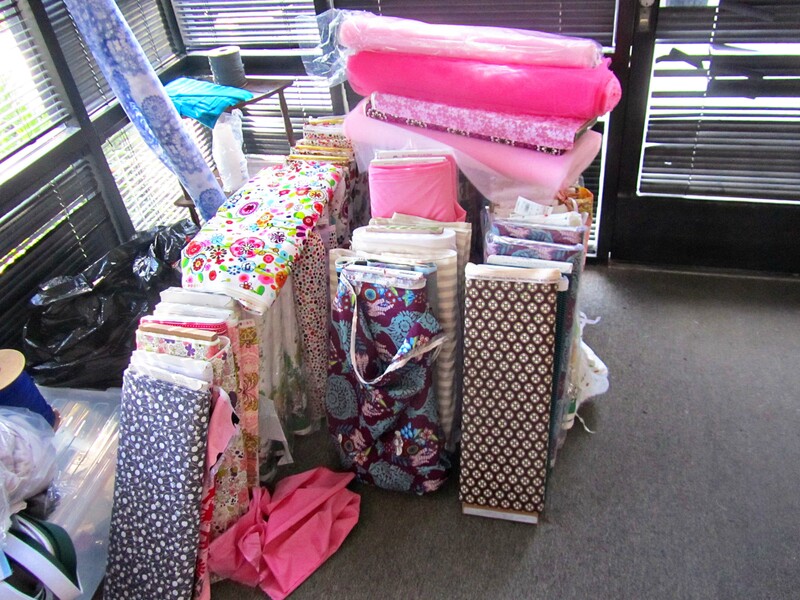 Nice fabric choices–that last one is the same as one of Madeline’s fall line dresses, isn’t it? It was my favorite color combo–classic with a little girlie mixed in. You are right. Actually, that is her skirt. We were both in there talking business. Most of the fabrics in the first photo are also Maisonnette. That is really interesting! 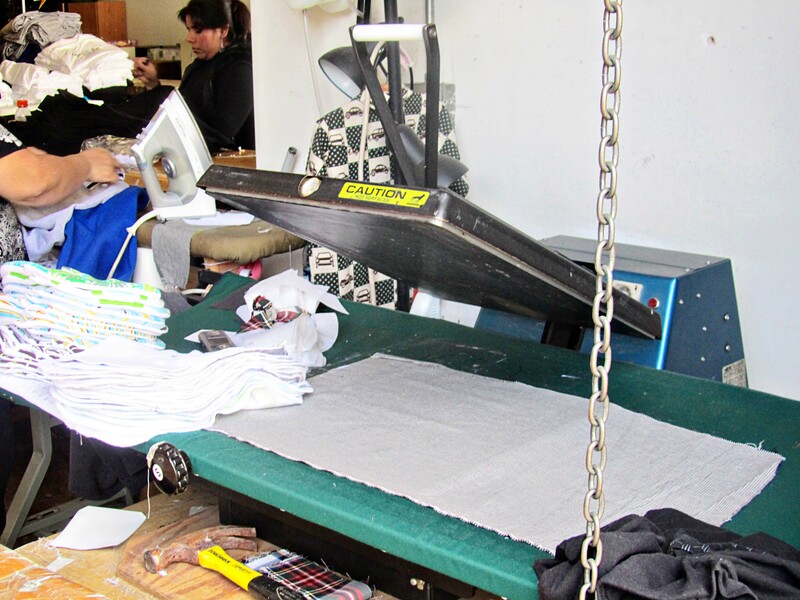 Thanks for documenting it all so we have a small idea of what it’s like to make a few pieces of clothing. Definitely a lot of work going into it all! Very interesting! Thanks for taking the time to document all of this. Who knew what went into a simple t-shirt??! Never thought about it much.